“A la Nanita Nana” is one of my favorite lullabies. It was originally a Spanish Christmas Carol, but it has become popular as a lullaby in Spain and South America. Can you imagine a Nana singing this to an infant? I used to sing this to change up our lullaby routine when my children were very little and the bedtime routine was much longer. I always found this song very calming. Did you ever feel the need to change from your usual lullaby? Were there songs that go you through comforting a tired and cranky infant in the middle of night? Were there songs that you sang more for yourself than for the baby? Mi Jesús tiene sueno, Bendito sea, bendito sea. When you’re little, waiting is THE WORST THING EVER! If you’ve played one too many games of I Spy, try singing a song next time. Here’s two songs from different countries that you can try. Part of the fun of this song is starting to sing it slowly and each time getting faster and faster. It leads to lots of giggles, but it might earn you some funny looks in the checkout line! This might be a good one if you have to wait in the car, since you can play the game with hand movements while sitting. Because “Kye Kye Kule” (said chay chay koolay) is a call and response song, children can repeat what you just said, so they can sing it even if they don’t know it. Because each verse goes with a part of the body (1. Head 2. Shoulders 3. Hips 4. Knees 5. Toes), kids can touch each body part (think “Head, Shoulders, Knees, and Toes,” but without the little ones always being behind!) after you show it to them and as they sing it back. This is a great song to help shake the sillies out! Do you have songs that you sing to help make waiting easier? To which songs and games do your children respond best? If you’ve got a sure-fire boredom-buster, please share! Every parent knows that this is next to impossible to do in a timely manner when you have young children. Being late becomes a normal part of life. 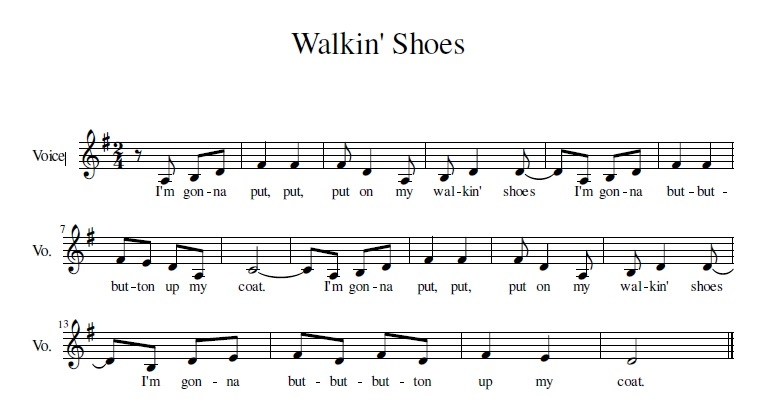 Try singing this song the next time your little ones are dawdling. Everyone needs a clean up song! There are so many and so many ways you can make one up. If you don’t already have a favorite, you can try one (or all!) of these from this video from mymissnina.com. We use the good old Barney stand-by in my house, probably because it stuck with me from having to tolerate my cousins watching Barney. The simpler, the better, so your little ones can sing along! I’m linking this post on parenting tips for making music everyday. Relax. You don’t have to be playing concertos or singing arias to make this happen. Make music part of your routine. Everyone knows lullabies, so start there. Do you have a clean-up song? Learn one or make one up. If your children are very young, the simpler, the better. Challenge yourself to come up with a new song for your routine this week. Try to sing it every time. Don’t worry if it’s not exactly the same each time! Music never is exactly the same during every performance! Let me know if you’ve tried a new song at home!